There are few things that make me happier than a good picnic. Everyone bringing their favorite snacks, sharing some wine and lounging on the grass together is one of the things I most look forward to every year. We're especially lucky here in New York where we have things like Philharmonic in Central Park and Brooklyn Bridge Park outdoor movie nights. 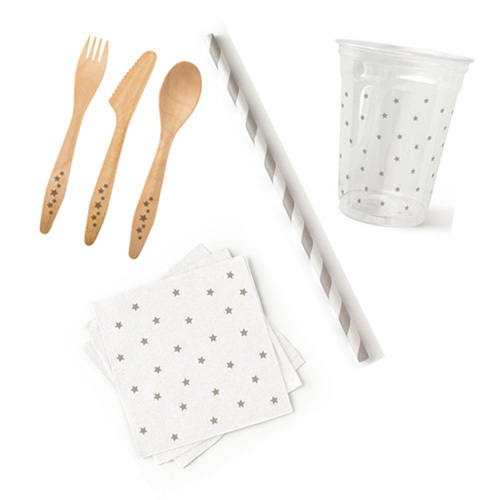 So when I was browsing at Foragers' "Craft Fare" event and came across Susty Party, a Brooklyn-based company that produces "beautiful, sustainable, compostable party tableware," I was obviously thrilled. The potluck aspect of picnics can lead to a chaotic and mis-matched tablescape. Because I love to make the everyday beautiful, I usually offer to provide the cups, plates, napkins, etc. for our group picnics - this way I can be sure that everything coordinates! I've completely fallen for Susty's grey stars collection. I love their focus on sustainability, and of course the fact that they're a local Brooklyn company. This will definitely be the focus of our next picnic! Tomorrow I'll be sharing the rest of my picnic essentials. In the meantime you can check out my "Picnic Design" board on Pinterest for inspiration, or my round up of picnic baskets from earlier this spring.